These tasty little cabbage parcels are filled with a vegan loaf mixture made from nuts, beans, and rice. It makes a fantastic healthy vegan centerpiece dish during the holidays. This dish can be made in advance and refrigerated; it reheats well. Using a food processor fitted with the metal blade, process the walnuts into very small bits. Pour out the walnuts into a large mixing bowl and set aside. Add the garbanzo beans and brown rice to the bowl of the food processor and process until the mixture forms a coarse mash. Add to the mixing bowl along with the oat bran, marjoram, thyme, onion powder, soy sauce, and mustard. Using your hands, knead the mixture well until it is thoroughly mixed and holds its shape. Set aside. Bring a large saucepan of salted water to a boil. Add the cabbage leaves and cook for 2 to 3 minutes (the leaves should be limp enough to roll but not cooked through). Drain the leaves thoroughly. Divide the bean and rice mixture into ten equal pieces. Form each piece into a tiny round loaf. Place a cabbage leaf on your work surface (if there is a rip in the leaf, cover it with another small cabbage leaf; if the leaf has a tough middle stem that won’t roll, cut it away and overlap the remaining leaf). Place a loaf at one edge of the cabbage leaf and roll it up, folding in the edges as you go. Repeat with the remaining bean and rice loaves. 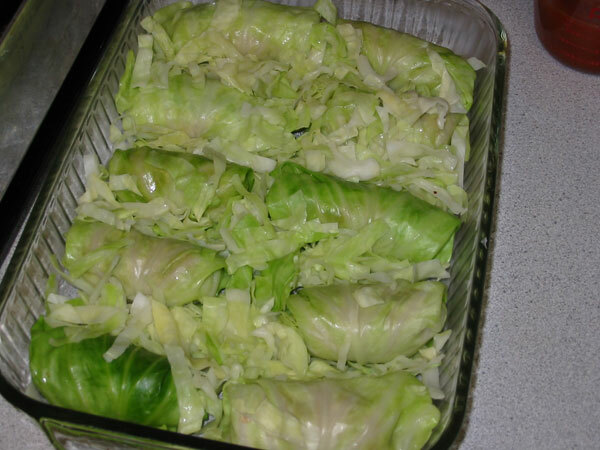 Place the cabbage rolls seam side down in an oiled baking dish. Use a knife to shred the remaining cabbage leaves and pieces you have left over. Sprinkle the shredded cabbage over and around the cabbage rolls. Mix the tomato juice and lemon juice together and pour evenly over the rolls. Sprinkle with salt and pepper to taste. Bake the rolls for 45 to 50 minutes, until gently brown on top. 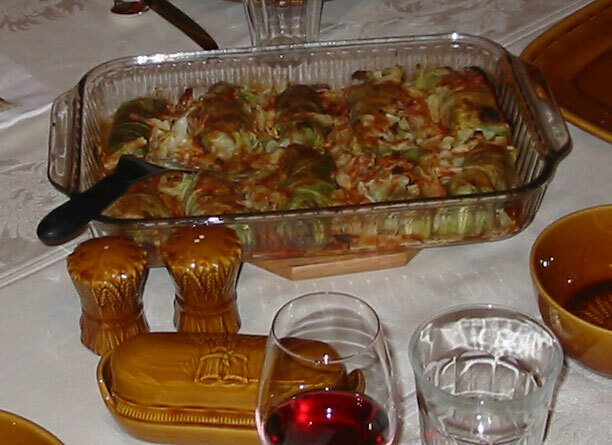 This is wonderful; my Polish mother has always made stuffed cabbage, but she's always made it with a pork-and-rice filling. Consequently, I haven't had stuffed cabbage in over eight years. She might be interested to see this recipe as well; although I doubt that at 75 she'll change her magic formula! Jennifer, thank you for sharing your recipes with us, vegan recipes are always in short supply.I look forward to trying some of them in the near future. I got stuffed cabbage leaves as a child as Scuba Diva did. I definately will try this recipe. It looks really good. My dad sent some walnuts over to England. I will use them. Cannot wait to try it. Yummy!! Do you think you could rework the recipe as a crock pot stuffed cabbage stew? This looks great! I've inherited my in-law's Hungarian cabbage roll recipe, and until now I didn't know what to substitute for the meat. I will definitely try this! Thanks for sharing. Use 1/2 cup minced onion in place of onion powder. And, since I'm not a vegan, a beaten egg stirred into the mix. Sounds great. I'm eager to try them. Is there any trick to getting the leaves off the cabbage? I get them off, but mostly they're in small pieces by then. Decided the mix didn't need the egg. Next time, though, it will have some garlic. Some heads are more stubborn than others. If you have a tough one, keep dipping the whole head briefly in boiling water. The leaves will come off much easier. Then proceed with the recipe, perhaps shaving a bit of time off the cabbage leaf boiling. One thing that is really rather tasty is using cabbage that is pickled whole, sold in plastic wrap in Superstore. Adds a fantastic flavour... a trick learnt from my Romanian friend. AMAZING. I love cabbage rolls, haven't had any since I was a teenager! This brings back memories. Thanks for the recipe. Substitute any other nut or seed you like. Someone substituted pecans and noticed the loaf was drier, so make it an oily nut or seed for proper consistency. If it seems dry add a bit of liquid to it. I made a veggie loaf 2-3 days ago using your magic veggie loaf recipe generator (I forget it's 'real' name) and am planning on making these tonight using some of the leftover loaf~ I'm the only vegetarian in my household, and most things I make I end up eating for days because no one else wants any... so re-purposing leftovers is always something I'm interested in, and your cabbage rolls look so good... well, I can't wait! 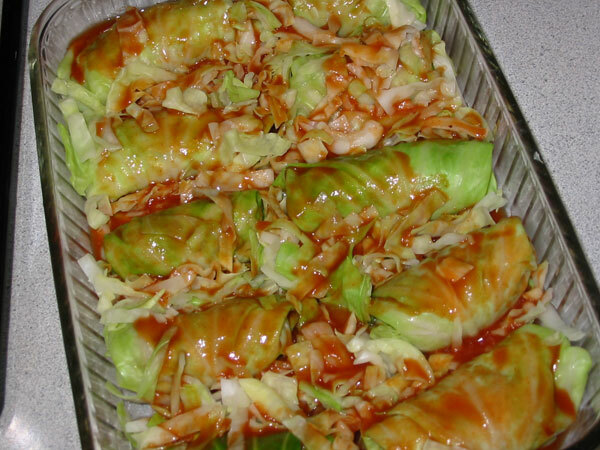 I've never made or eaten cabbage rolls before, but I've wanted to for a LONG time. Tonight's the night. Thanks for your user-friendly recipes!! And... speaking of veggie loaves... Thank you *again* for that!!! I've tried a variety of loaf recipes over the years, but they're either too rich with lots of nuts and cheese or too 'lentil-y' (not being a huge fan of the lentil). I followed the recipe I invented exactly* and was thrilled with the colors and consistency and taste of the finished product. It was *perfect*. A little ketchup on top, and mashed potatoes on the side made for such good "Mom" food :-) Looking forward to trying out lots more of those when I have things on hand like cooked rice. *actually, not so 'exactly'. I thought I had some black beans in the cupboard but I didn't, so I used kidney beans instead. Talk about colorful... sauteed carrots, fresh parsley and the deep red beans made for a dish just bursting with nutrition and flavor! Fabulous. I made this recipe this weekend. So good, my husband and I nearly slapped ourselves!! I used crushed tomatoes instead of just juice. To die! its vegan golumpki!im vegetarian and my mom has always made me this with mushrooms and rice instead of the meat filling. what do you suggest as a substitute for the walnuts? I'm severely allergic to peanuts & tree nuts. I cannot wait to try this!! :) Thank you. I am almost certain one can crock pot this dish! It would take some experimentation possibly. I will try that method myself because I am not keen on putting the oven on at this time of year. OMG this looks so yummy I have to try this!! I am still making these cabbage rolls for almost a year now! My family loves it! The secret to getting cabbage leaves off intact (without scorching yourself!) is the freezer. Put the whole head of cabbage into the freezer for a couple hours or a day ahead. Let it come to room temp and it will be tender enough to remove leaves and make rolls.